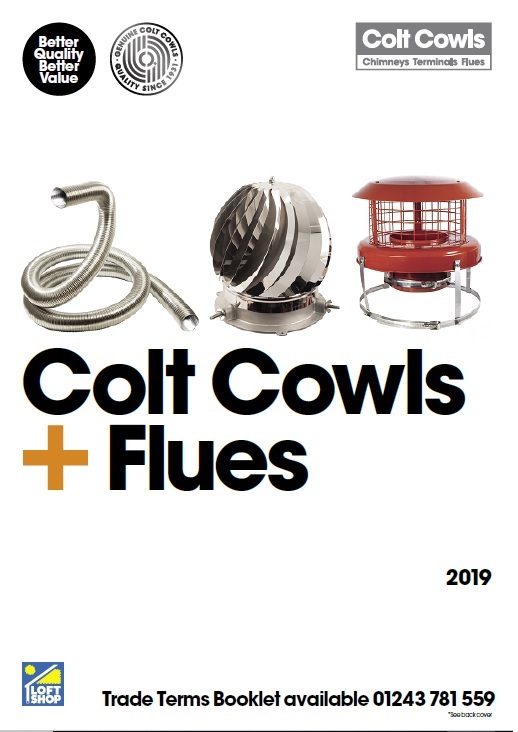 The 2019 Colt Cowls Trade Catalogue is out now! Simply click on the brochure image below to download a PDF copy or call 0870 2411041 for your FREE hard copy! To receive a copy in the post, please complete the Contact Form and be sure to include your address in the comments box, alternatively you can email enquiries@coltcowls.co.uk with your address details. The New Colt Cowls Catalogue now includes a vastly increased range of chimney liner components. As well as the new Flexiwall range, Colt Cowls can now offer Turner & Wilson chimney liner, a favourite of installers since 1964. Other new products you will now find listed are the Star Flex Adapters and screw fit adapters suitable for use with Flexiwall chimney liner, as well as the new electric Draftbooster! As usual Colt Cowls has the most comprehensive and best quality range of chimney cowls available on the market.